But yesterday, I had one of my worst craft-related ideas. I decided to pre-wash the fabric for a quilt while I was making the quilt. I’ve done it before. I get the top done (usually it’s for a children’s charity quilt), and I decide I want to wash the top and backing so it doesn’t pucker too much after it’s quilted and washed again. True, the top gets a little frayed, but no big deal. 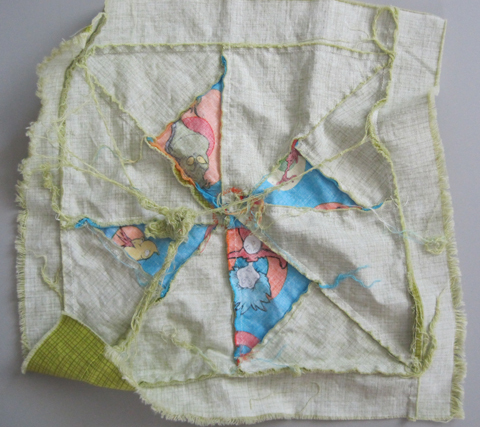 For this particular children’s charity quilt, though, I planned on using the quilt-as-you-go technique, where you quilt individual blocks and then join the quilted blocks into a quilt. So I washed the sewn blocks. Disaster. 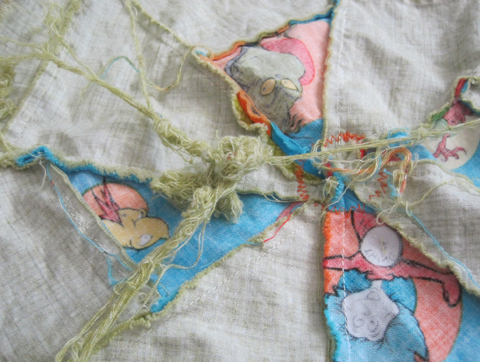 They frayed like crazy. Did you see that giant knot of threads in the photo above? Here’s a better look. The threads I cut from all the blocks ended up being the size of my fist. 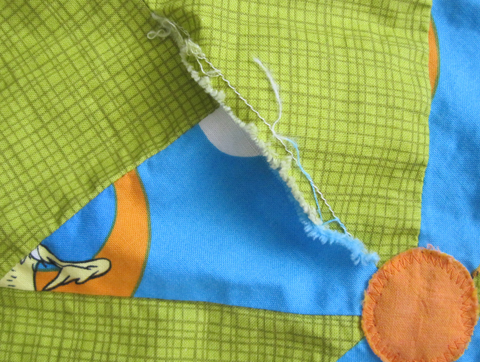 And some of the seams even came apart. Good thing that happened to me, though, and not to some poor child at the Ronald McDonald House. Even after I took the blocks out of the washer and saw what a mess it had become, I didn’t take the hint. I went ahead and washed the batting and backing in the next load. Disaster, part two. On delicate, the batting still came apart. On the plus side, I think that’s the most lint I’ve ever seen in the dryer lint trap. The blocks shrunk enough that I need to make a new plan for the quilt, possibly adding borders around the whole quilt to get it back to the 40″ x 40″ size it needs to be for donation to the Ronald McDonald House. My enthusiasm for this project has cooled off considerably. But I think that’s part of my problem. I get so excited about starting a new quilt that I don’t stop to think if I want to pre-wash the fabrics are not. I just want to start sewing. 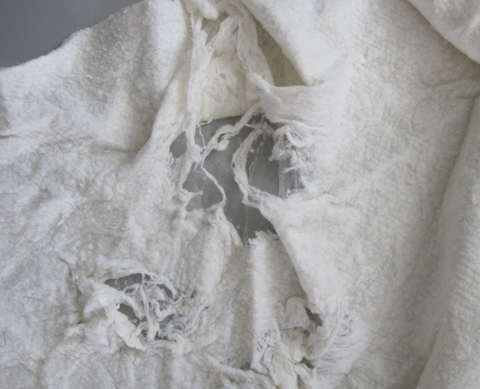 And I don’t want to pre-wash all my fabrics, because sometimes I don’t plan on washing the piece or I want the pucker. But I’ll get back to it before too long. 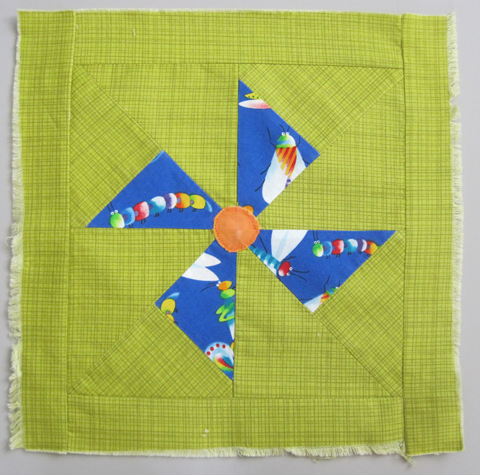 I do think these pinwheel blocks are cute. And I do want to make a quilt-as-you-go quilt. I just need a little time to recover from this craftastrophe. Consider soaking and drying. I don’t know if you agitated in the washer, but it is best not to. Even when washing a completed quilt, soak and spin dry. Hand agitate if you want. A lesson learned, Chris, we have all done it. A lesson learned, indeed. Thanks for the advice, Mom. oh no! Sad story. No harm in coming back to it later though. I would be frustrated too!